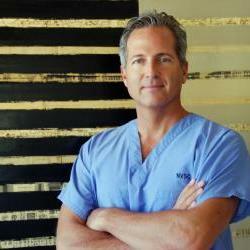 Scottsdale plastic surgeon Dr. John J. Corey has practiced in Arizona, since 1993 – beginning his practice immediately after completing his residency at the Medical College of Georgia and further cosmetic surgery training in Brazil. He is board-certified by the American Board of Plastic Surgery, a member of both the American Society for Aesthetic Plastic Surgery and the American Society of Plastic Surgeons, and is the former Chief of Plastic Surgery at Good Samaritan Regional Medical Center in Phoenix. Dr. Corey has been voted one of the top doctors in plastic surgery by Maricopa County physicians in a CBS Channel 5 poll and by his peers in the yearly "Top Doc" edition of Phoenix Magazine. Dr. Corey frequently lectures at Arizona State University, and he is an Affiliate Assistant Professor at Midwestern University. Dr. Corey is also one of the most respected and sought-after faculty members at the Osler Institute, which provides hands-on review for practicing plastic surgeons worldwide who are preparing for their own board-certification. Please visit our Forums & Lectures page for additional information. If you are looking for a plastic surgeon in Scottsdale, Phoenix, Chandler, Mesa, Tempe, or throughout Arizona, please contact John J. Corey, MD online or by calling our office at 480-767-7700 to schedule an informative consultation. At our Scottsdale plastic surgery office, Dr. Corey draws on his extensive training both in Brazil and here in the United States. After graduating from the University Of Utah School Of Medicine and fulfilling prerequisite training in general surgery at Maricopa Medical Center in Phoenix, Dr. Corey entered the Medical College of Georgia in Augusta to begin his plastic surgery residency. It was there that Dr. Corey met Dr. Renato Saltz, one of his professors, who introduced him to some of the surgical ideas and concepts of Brazil. Intrigued by the Brazilian approach to plastic surgery, Dr. Corey traveled to the country in July 1993 to study in Rio de Janeiro, Sao Paulo, Porto Allegre and Belo Horizonte, spending involved and intense surgical training with some of the world's experts in aesthetic surgery. His training there taught him to view plastic surgery from a more artistic standpoint. Our Scottsdale plastic surgeon explains that there are several reasons why the Brazilian approach is somewhat different from that of many American surgeons. "Brazilians seem to have more of an artistic eye, not relying on the same measurement for every woman. We Americans have a tendency to be very technical. We want to know exactly how much to contour and how much to measure. Brazilians seem to approach procedures more artistically. They really believe in sculpting the form and creating curves and lines of the feminine shape. Ultimately, this approach appeals more to my philosophy, helping me provide a balanced approach to surgical beauty." There are multiple procedures where Dr. Corey specifically calls upon the techniques learned in Brazil and many where he has formed his own hybrid of both countries to adapt to the different populations. Dr. Corey feels he gets the great Tummy Tuck results seen because of the different type of suturing he does to the abdominal wall, being much more aggressive than what he learned in the U.S. He feels the same way with his breast lift technique. Many techniques learned and used in the United States try to keep and use the least supportive part of the breast in a lifting procedure and as Dr. Corey learned in Brazil, it is this part of the breast that should not be depended upon for support. Dr. Corey feels that adherence to just this one principle makes a big difference! If you would like to learn more about Dr. Corey's philosophy, please click here to read a short interview or call 480-767-7700 to schedule a personalized consultation. We welcome patients living in Gilbert, Phoenix, Mesa, Tempe, Chandler and nearby areas at our plastic surgery facility in Scottsdale. See how Dr. Corey's numbers (PDF) for procedures performed compares to the average number performed by other American Society for Aesthetic Plastic Surgery surgeons. Committed to helping people during all stages of transformation, Dr. Corey offers the exclusive plastic surgery boot camp program, designed to mentally, physically, and emotionally prepare patients who are not yet ready for a procedure, allowing for optimal comfort and increased safety when they are. 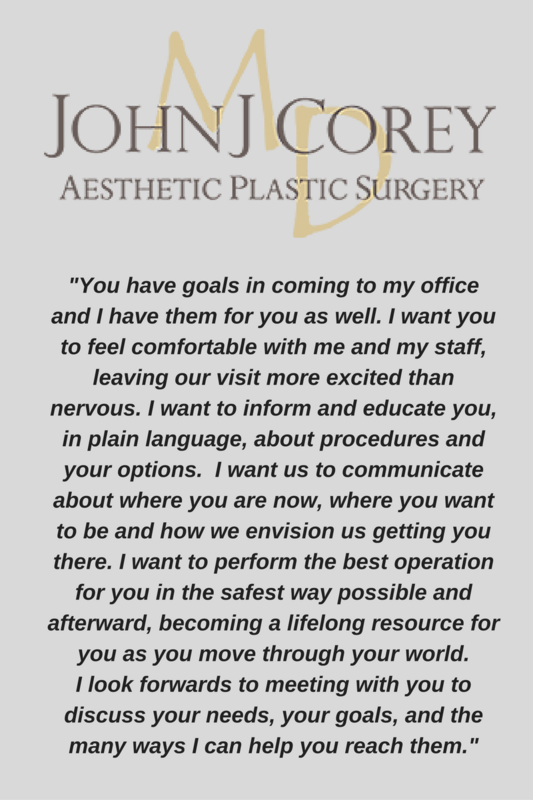 This level of commitment to patient satisfaction is standard at our Scottsdale plastic surgery practice and a cornerstone of our patient care philosophy. If you are considering plastic surgery in Arizona, we welcome an opportunity to meet with you to discuss your goals and to help you better understand the benefits of those treatments best suited to address your specific needs. To schedule a consultation with our board-certified Scottsdale plastic surgeon, please call 480-767-7700 today. We serve patients from Tempe, Phoenix, and all areas of Arizona.